I think that Amorta starts where the Grand Finale has ended. I always found the Grand Finale as a sort of untold story about my own funeral. The first part is if I look to my own funeral with all the crowd surround the grave. But then ... you realize that you don't want to die and try to escape from the death (Robin Trower's marvellous way of playing that) and after that you hear the inescapable rhythm of the death and you see that it's senseless to protest! With Amorta I had the same feelings, but it is a start of the CD. After a moment of painful feelings about the knowledge of saying (a long) goodbye to your dearest ones, (see the front cover), you have to come back in the (high) life again. Trees unlimited is the restart of your life. The guitar is like telling you the story that your life isn't so bad. You're surrounded with beautiful nature with trees everywhere in a world that is more sensible and in harmony. Throughout the rest of the CD you'll hear much more in "up-tempo", which means that everything turns on in a way as it always was. Not bad, not good, with tense sometimes (the beginning of room one-O-four, which tells a story of somebody who met a beautiful (married ) girl in a hotel for a forbidden love. Yes, at room 104!). Also things that can happen in everyone's lives. It all ended in Terracotta Pavement, a happy end for an "untold" story. Listen to the Fisher-like organ, a direct link to PH music. (I also did it in Live To Love; a reference to Mike Oldfield's Tubular Bells). 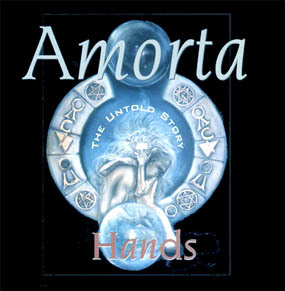 Amorta is a contraction of the Italian words "amore" (love) and "mourire"( to die). On the cover you see the girl (she's alive ) say a definite farewell to her friend (who's dying). The one who made the cover (Els de Vocht in Rotterdam) made this after I told her my story. This kind of music is a splendid way to remember almost-forgotten things because of the suggestion of the music. Like Matthew Fisher's Separation. And ... sometimes you should play it loud! About myself ? There's not so much to tell otherwise that I'm a good keyboard-player with a lot of ideas. And I know a lot of people in the music business. For my job, I have my own assurance-agency, that also gives advice for financial problems. I have some well known clients as two members of Golden Earring. Once I met Rob (Winston) van der Zwan. He was at that time a famous session guitarist in the Wisseloord Studios in Hilversum together with Jan Akkerman (Focus). Rob did a lot of sessions for producer Hans van Hemert (Luv', Mouth and McNeal, etc.) He also played in the sixties with "The Haigs" . They were very famous in France and they even played in the Olympia in Paris with Brigitte Bardot among the visitors. Rob heard some parts of my music and was very enthusiastic. I asked him to join me in the studio and he made Amorta possible. So, that's my story. As you read it in the inlay, I had to wait more than 25 years for this chance and now I'm happy and full of ideas for a next one.